Iowa Flooding, May 2008: a FAILURE of "Government" to care enough for its people. 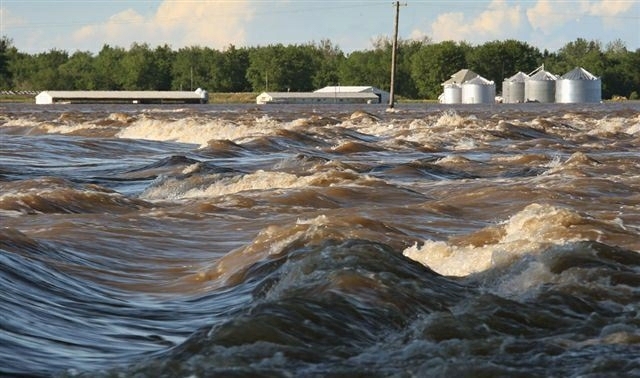 These are some really good pictures of the actual flooding in Iowa. I think a lot of them are of downtown Cedar Rapids, IA. THIS OUGHT TO MAKE YOU THINK about the media and politics, and how they talk and talk and talk, and in the end, do nothing. New Orleans gets Zillioin$, but what to hard working Iowans get?! WHAT'S THE DIFFERENCE BETWEEN IOWA (THE LITERAL "HEARTLAND OF AMERICA") AND THAT CESSPOOL OF SOCIAL INIQUITY CALLED "NEW ORLEANS"? NEW ORLEANS KNEW THAT A HURRICANE WAS COMING AND CHOSE TO DO LITTLE, THEN EXPECTED THE GOVERNMENT AND THE TAXPAYERS TO REBUILD THE CITY, AND THEIR HOMES, TO A CONDITION BETTER THAN THEY WERE PRIOR TO THE HURRICANE. In Iowa, during May of 2008, farmers and city people all over the State had no choice but to simply watch it rain, and rain, and rain all the more; made worse was the worst winter snows in local history; and when melting, that water added to the excessive rainfall that followed in the Spring. Flooding was everywhere, heavy and high, record heights, and that means everywhere. Billions of dollar$ were lost in homes and farms, and food crops. And yet while in a previous exercise of the abilities of the Federal Emergency Management Agency (so-called “FEMA”), that Agency went out of their way to help in every manner possible the “minority races” of New Orleans, in Iowa during early 2008 FEMA said they would help Iowans; and yet well after the flooding disaster was gone, FEMA condescended to arrive to consider the damages, and then said in its infinite bureaucratic wisdom that FEMA would require “two weeks” or more to decide what Iowans needed and what to do about it. Eventually, from FEMA, little to nothing was offered to Iowa, less was received. In the end, the "content of their character" revealed that the people of Iowa, being in the majority a Caucasian race, were capable of fending for themselves (unlike other "welfare-trained" minority races) , and they had no choice but to address the circumstances and resolve it as best they could, being ABANDONED by their supposed Federal Government which tauted how much they offered their "citizens." And they did so, as Caucasian people always do: on their own, on their own dime. FEMA and the Federal Government failed Iowans (as they will fail any other majority racially Caucasian raced State), and little more should the Iowans consider as useful a "government" that does much for one "racial people" (the Negroes) and nothing for another "racial people" (the Caucasians). Why should Iowans support such a negligent Government? WHRE WERE THE "HOLLYWOOD" CELEBERITIES, holding telethons, and asking people all across America for help in restoring Iowa, and helping the folks affected by the floods? There must be a big difference between the “values” of the people of Iowa and “values” of the people of New Orleans, Louisiana, otherwise, the response from those who went out of their way to help the "minorities" of New Orleans would have equally helped Iowans. After all, "are we not all equal"? The Reader is encouraged to sent these unfortunate images of unrequited Iowa misery, as unedited factual information, Forward to whomever the Reader may know who would have enough inner strength to recognize the contrariness of our Federal (and as often, State) Government(s), when such supposed "representative governments" consider the afflictions of White people and of Black people, to get Americans thinking about what needs to be done to return our once great nation to its former place --- if taht is at all possible. Let's 'float' this one around for a while on the Internet, proving, in contrast, all of the hullabaloo that New Orleans received. What did Iowa get? Somewhere between Nothing and A-Little, and very Little, at that. The Future of Washington D.C.